We draw water from a well, or from a tap. One hopes to draw the winning lottery number. At a dinner party, the tactful host seeks to draw out a shy person in conversation. When pushed to a limit, one draws a line in the sand. A drawing is the result, or the residue, of an action. The oldest recorded description of a line drawn is found in the Ramayana [circa 800-200 BC], when Lakshmana drags a line imbued with magic powers around the family house in order to protect his sister-in-law, Sita, while he goes off in search of her husband, his brother, Ram. As one might expect, complications ensue when a villain shows up, disguised as a beggar. 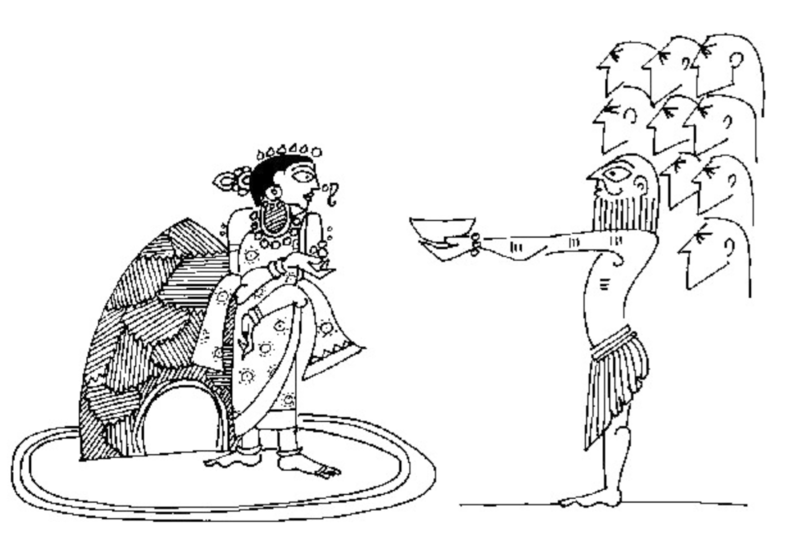 Sita has a difficult choice: she can stay inside the boundary and claim the protection afforded her as wife and sister-in-law, or she can act according to her obligations, and step outside the line in order to give aid to someone in need. She chooses the latter (she can't really do otherwise) and finds herself abducted. When this ancient line, known as the Lakshman Rekha, appears in contemporary Indian discourse, it generally refers either to a strict social convention or rule, never to be broken, or to the ethical limits of an action … a line in the sand. The dialectical dilemma intrinsic to the line may sometimes be suppressed, but it is never far from the surface. 02] In Naturalis Historia [AD 79] Pliny the Elder describes the origins of painting. It began, he says, with a single line, drawn by a young woman in Corinth whose lover would be sailing away the following morning. While he slept, by candlelight, she traced the outline of his shadow on the wall. As we seek to tease out the classical values encoded in the story, we can note that this drawing was not born out of an expressive artistic impulse. It involved observing and recording; it wasn't subject to interpretation. Instead, her creative leap was cognitive: the insight that a two-dimensional delineation of his silhouette, marking the edge between light and dark, could serve as a description, that it could represent him metonymically. While she was not necessarily invested in a result that would "look like" her soon-to-be-absent lover, the expectation of mimesis was not far behind. 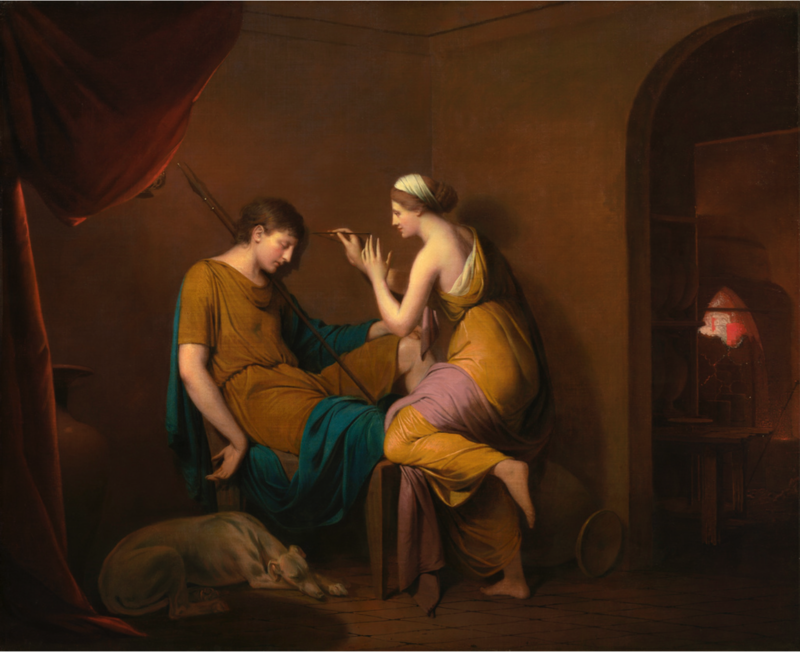 It shows up in the second part of the story, when her father, a potter, makes a bas-relief of the young man's visage using her outline as his guide, in the process giving birth to sculpture. Pliny's account resonates with the Allegory of the Cave in The Republic [circa 380 BC], where Plato posits that passing shadows are all we can perceive of reality, an insidious notion that has become deeply ingrained in western thought: The presumed superiority of the conceptual over the tangible; the privilege abstract knowledge enjoys over applied knowledge; the way art is valued above craft. In this paradigm what we can see, touch, smell, taste, and hear are mere shadows, imperfect imitations of the reality of ideas. Never mind that recent studies in linguistics and neuroscience tell us otherwise, that, in fact, we think through our bodies. The difference from Plato in this story, however, lies in her agency. Rather than simply observe the fleeting shadow, she draws its boundary. 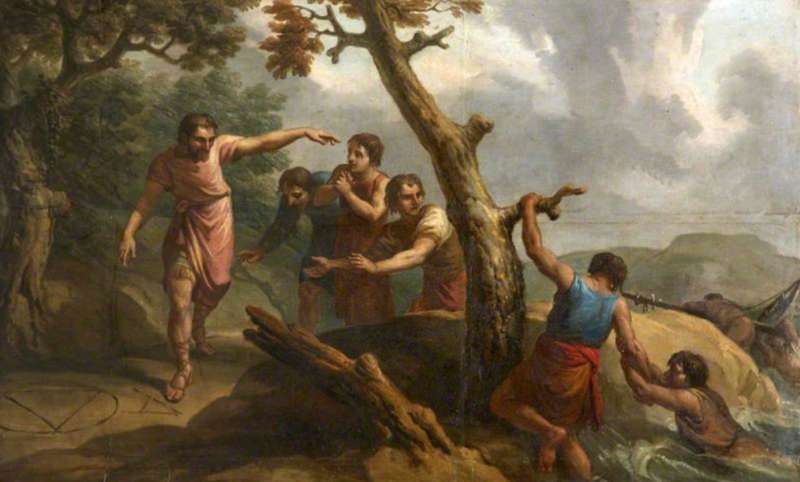 "It is related of the Socratic philosopher Aristippus that, being shipwrecked and cast ashore on the coast of the Rhodians, he observed geometrical figures drawn thereon, and cried out to his companions: 'Let us be of good cheer, for I see the traces of man.' With that he made for the city of Rhodes, and went straight to the gymnasium. There he fell to discussing philosophical subjects, and presents were bestowed upon him, so that he could not only fit himself out, but could also provide those who accompanied him with clothing and all other necessities of life. When his companions wished to return to their country, and asked him what message he wished them to carry home, he bade them to say this: that children ought to be provided with property and resources of a kind that could swim with them even out of a shipwreck." Vitruvius makes the moral of the story out to be about the value of an education, but one could just as easily read it as an identification of drawing with geometry and, beyond that, as a marker of civilization. In contrast, who can forget the moment in Robinson Crusoe  when the eponymous narrator, also a castaway, spies a human footprint on the beach of the island he had hitherto believed deserted? Far from sanguine about his discovery, he is terrified. Interestingly, Daniel Defoe is believed to have known a version of the Vitruvian story, retailed in a book he owned, Apophthegmes of Erasmus , where the original Latin phrase, "hominum enim vestigia video", is translated into English as "Behold these footsteps!" Drawing in the sand was apparently a common activity in the classical world. According to accounts by Livy, Plutarch, Cicero, and others, Archimedes was busily scratching diagrams when his home town of Syracuse was invaded during the Second Punic Wars. Marcellus, the conquering general, had given orders that Archimedes should be taken alive, so the Roman soldiers were asking people to give their names … before slaying them. When the soldiers came upon Archimedes, he was so caught up in his drawing that he neglected to answer, inciting them to a murderous rage. His last reported words were, "Don't disturb my circles." 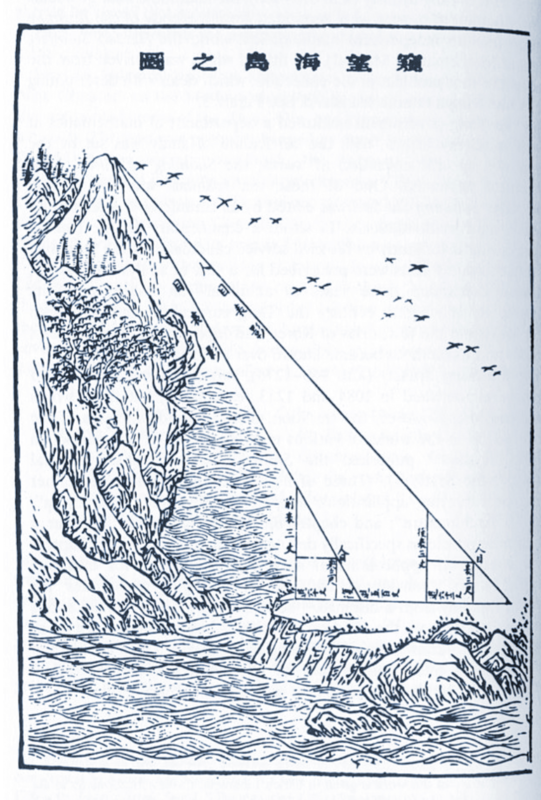 04] This illustration of the math problem that gives its name to The Sea Island Mathematical Manual, a textbook written by Liu Hui in China during the Three Kingdoms era, lifts the line from the sand and projects it into space. 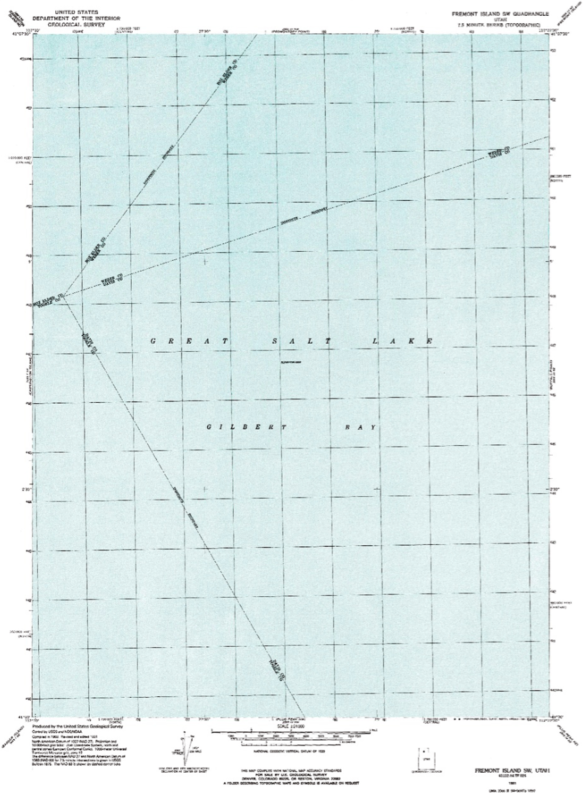 Conceptual lines share the page with representations of islands and seas. Only convention tells us which of the marks in the sky are symbols or words … and which represent birds. 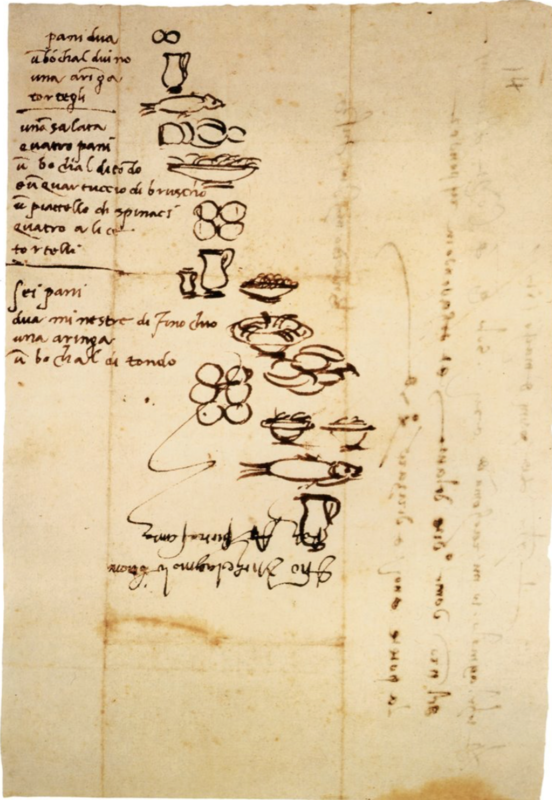 05] Sometimes we need a drawing to perform a simple, quotidian task, like this grocery list by Michelangelo, evidently sketched for a servant who couldn't read. Now that the initial job is (presumably) completed, we can ask ourselves, what is the drawing's present purpose? 06] Albrecht Dürer was apparently hard up against a deadline, and didn't have time to make a visit to his doctor, so he sent this drawing, to show where it hurt. 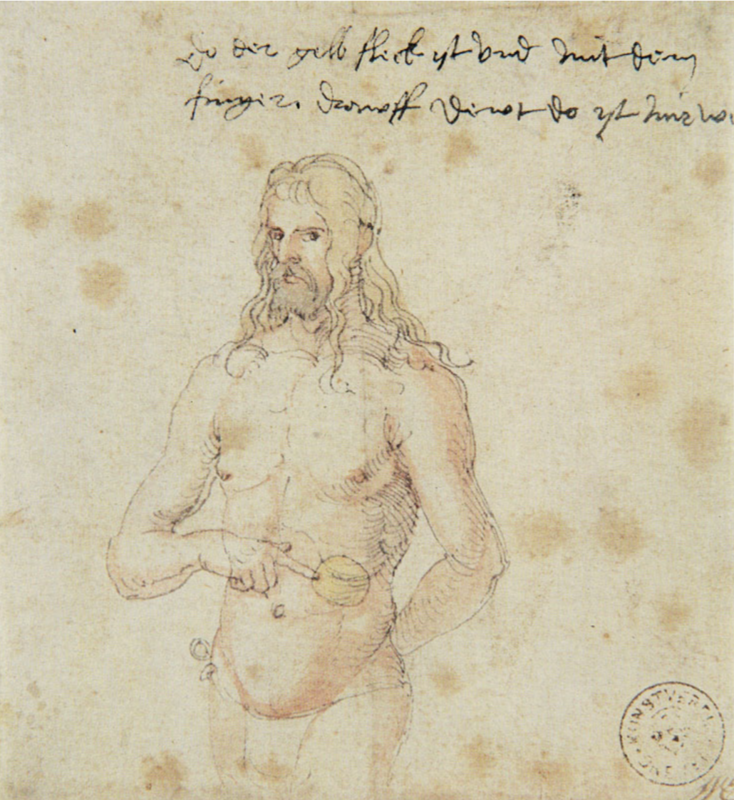 Dürer drew a lot of self-portraits, leading one to suspect he was rather pleased with what he saw when he looked in the mirror. 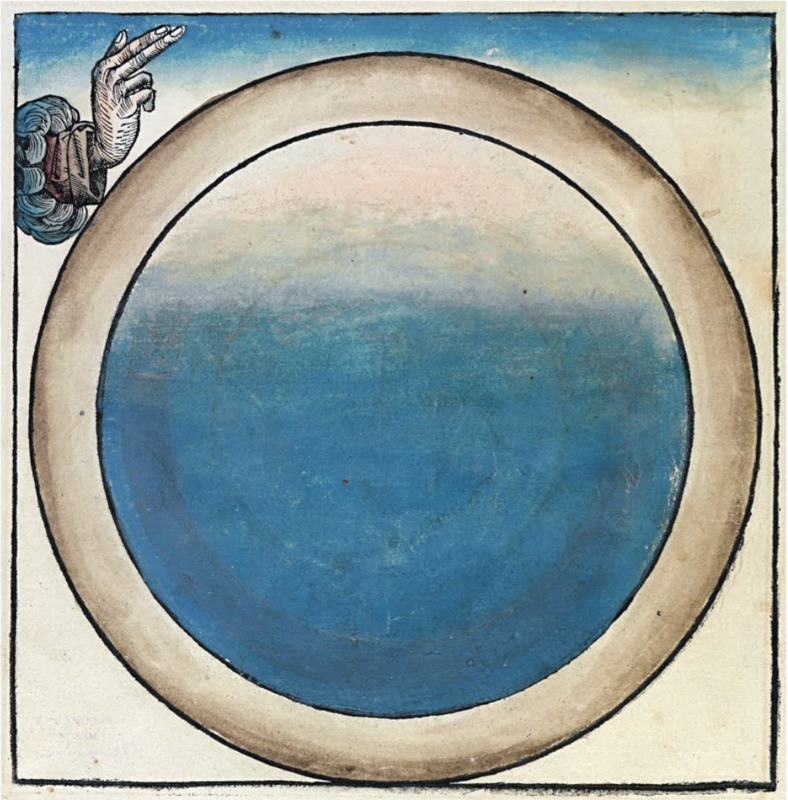 07] An encyclopedia from the late 15th century, the Nuremberg Chronicle, a lavishly illustrated compendium of everything about everything, begins with the Biblical account of the creation of the world, accompanied by a series of images showing the results of each day of God's labors. This woodblock print by Michael Wolgemut, in whose workshop Albrecht Dürer apprenticed, depicts the Lord's accomplishments on the first day. It combines three distinct modes of representation: rebus, mandala, and mimesis (serving up evocative, misty voids worthy of Caspar David Friedrich). Much of the poignancy derives from the awkward placement of God's hand, off in the corner of the image, in a residual space between the woodblock's square frame and the circles that describe the world-to-be. The hand pokes through the page with a cuff of clouds, elaborating the puncture like stitching on a buttonhole … as if acknowledging the futility of the attempt to describe the ineffable. It may also be worth noting that while the lines were printed, the tones and colors were applied afterwards, by hand. 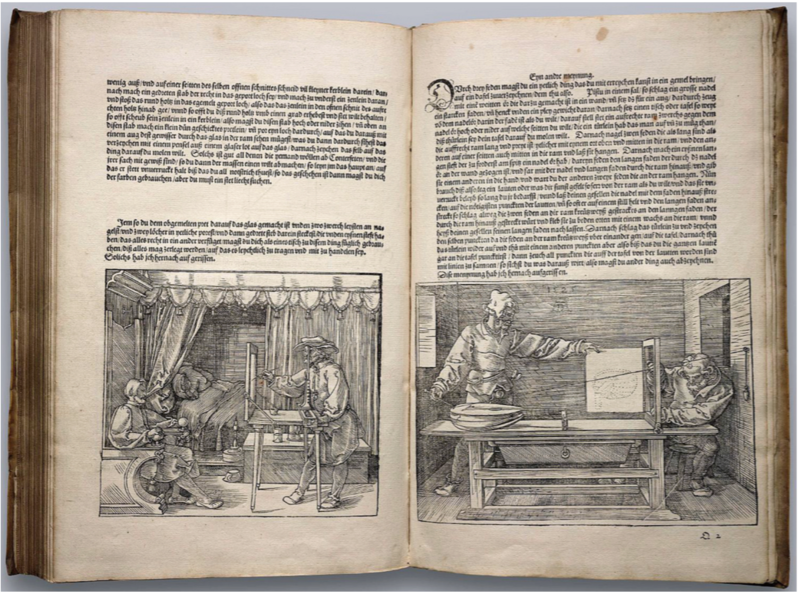 The book was published by Anton Koberger, the godfather of Dürer, whose family lived on the same street in Nuremberg. 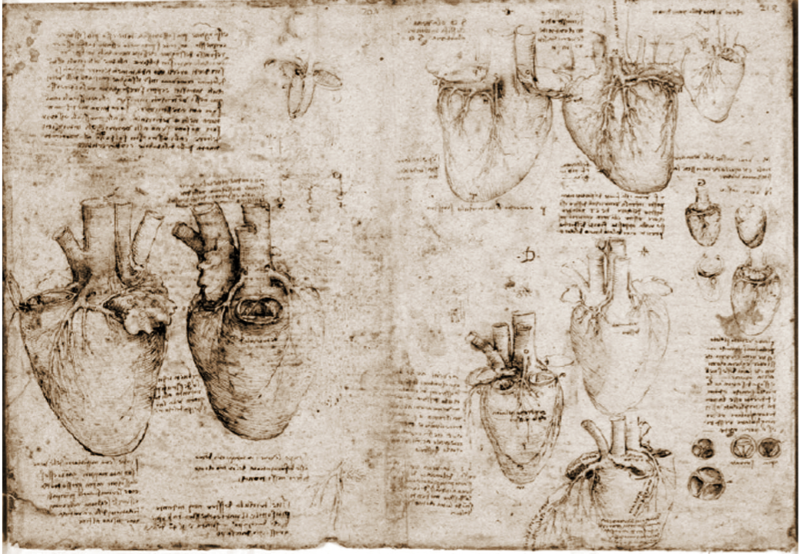 08] Like most artists of his time, Leonardo da Vinci's first efforts at drawing the human body depended upon received wisdom, rather than any understanding of the underlying structures. This he sought to remedy by observing dissections and autopsies, even performing several himself. As a result, Leonardo was the first to make an accurate rendering of the spinal column. Through his studies of the heart, he discovered that it had four chambers, rather than the two previously supposed, and that it operated with a twisting motion, wringing blood into the arteries. But I enjoy the way he draws the heart as if it is a root vegetable. 09] Brunelleschi is generally credited with inventing linear perspective in the early part of the Italian Renaissance, Alberti with formulating the geometric theory to support it, Bramante and Raphael with refining it in practice. The conviction that the new art of his day must be based on science and mathematics led Dürer, who had done his Wanderjahre in Basel, Colmar, Frankfurt, Strasbourg, and the Netherlands, to make two extended trips to study in northern Italy, where he is believed to have learned the new technique of perspective from Bramante. Once back in Nuremberg, Dürer devised an apparatus with a gridded viewing frame, a physical manifestation of the picture plane, through which, via careful observation, one could derive perspective views of bodies and other non-rectilinear objects as they appear in the world, rather than construct abstract models mathematically. The man (subject) looks across the tip of a sword-like implement, through the viewing frame's rational grid, to observe, measure, and draw the reclining, semi clad woman (object) on the other side. A feminist analysis of the image practically writes itself (as perhaps does a Freudian one). The reclining posture, however, was strongly influenced by the violently foreshortened perspective in Andrea Mantegna's painting Lamento sul Cristo morto [circa 1480], which Dürer much admired. 10] In 1609, Galileo Galilei heard reports of patent battles raging in the Netherlands between two eyeglass makers, Zacharias Janssen and Hans Lippershey, each wanting credit for the invention of "Dutch perspective glasses". 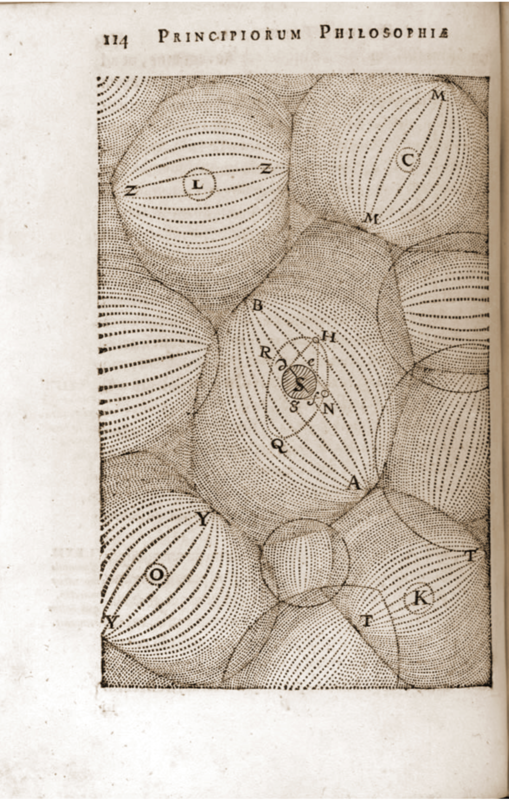 Inspired by accounts of the device, Galileo developed his own version. 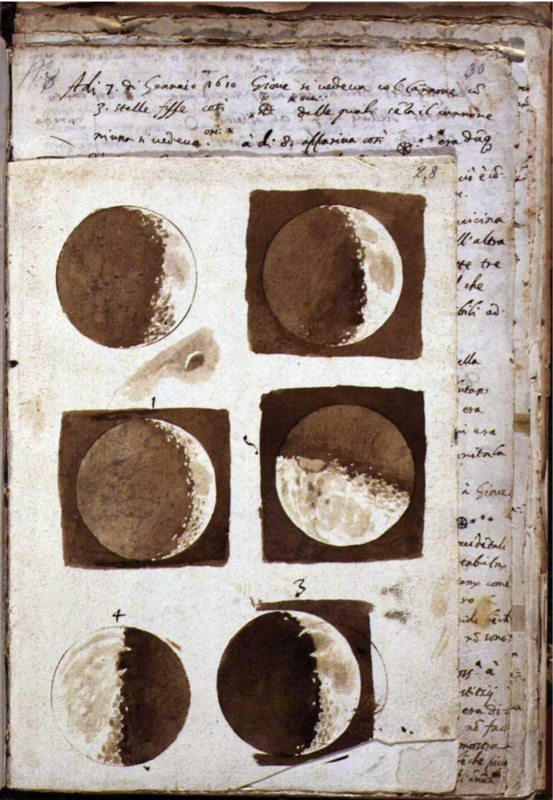 He was one of the first to train it on the sky — to study the moon, the planets, the stars, comets, even a supernova — and a year later he published a number of his early observations in a little book, Sidereus Nuncius (Starry Messenger), which included a number of his drawings of the moon. Thomas Harriot, an English mathematician and explorer, made telescope sketches of the moon that preceded Galileo's treatise by a few months. But while Harriot noted a "strange spottednesse" on the surface, he put forward no hypothesis about the possible cause. Galileo, on the other hand, deduced that the patterns of light and dark that shifted as the moon waxed and waned were, in fact, the shadows and highlights of mountains and craters. By measuring these as they moved across the surface, he could estimate the heights and depths of the moon's topography. Though splotches on the moon are readily visible to the naked eye, historically they had been understood as merely discolorations of the surface. Until Galileo, no one had had a reason to challenge Aristotle's claim that the moon was a smooth and perfect sphere. 11] All three claimants to the telescope — Janssen, Lippershey, and Galileo — naturally turned their gaze in the opposite direction as well, developing various versions of the microscope. Galileo, a proud member of the Accademia dei Lincei (the Academy of the Lynx-eyed), an early and significant scientific society based in Rome, sent one of his devices to two of the founders, Federico Cesi and Francesco Stelluti. 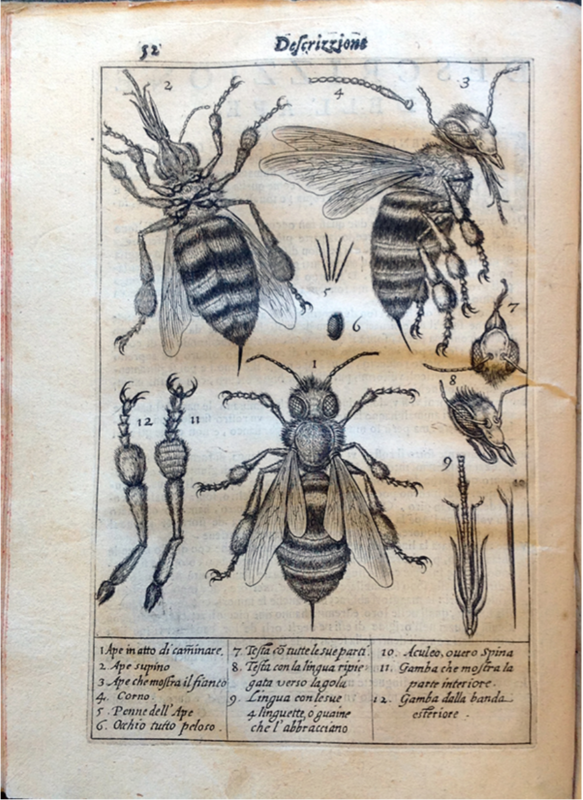 Stelluti's subsequent description of a bee is the oldest known published image of an organism observed under the microscope. 12] René Descartes, generally regarded as the father of modern western philosophy, the Cartesian coordinate system, and analytical geometry, also developed a theory of planetary motion positing that space is not empty, but rather full of invisible matter, a Plenum. According to his theory, the planets are pushed around by these pillows of fullness. In the sense that he attempts to show what cannot be seen, his explanations are far from the observations of Galileo and Stelluti. 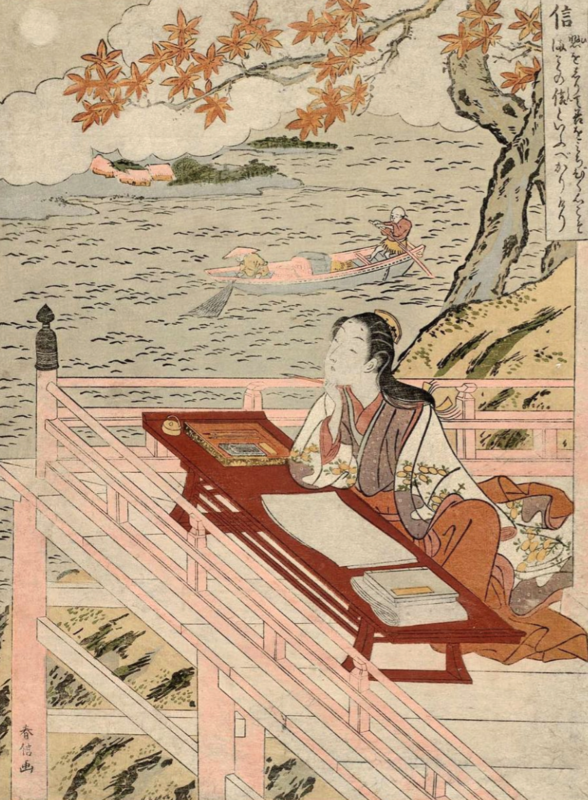 13] Lady Muraski's Genji monogatari (The Tale of Genji), published in 1008 AD, at the apogee of the Heien period in Japan, is often referred to as the world's first novel. This image, made some eight centuries later, shows the author dreaming, drawing, writing, "inspired by the moon". Beyond the ravishing color palette, the elegant delineation of her immediate environs in cabinet projection — a world apart from the fishermen and the distant island village, portrayed in atmospheric perspective — one can also relish the detailed description of her desk, where her materials and implements are arrayed. 14] If we can settle on any one thing that all peoples may be said to share — from all cultures, all places, and all times — it must be toilet humor. This detail from an Edo-period scroll is a case in point. The entire ten-meter-long episodic drawing is devoted to depictions of fart battles. The comedy masks a tragedy: During this period in Japan, the fart was a metaphor for foreigners, in particular European traders intent upon colonizing them, who were considered to "smell bad", both literally and figuratively. In fact, the scroll may have served as thinly-veiled propaganda, similar to a political cartoon, militating against the influx of gaijin. How does one draw a fart, which can be smelled but not seen? Here, the anonymous artists have used grey plumes to represent the deadly trajectories. 15] The United States of America labors under two grave original sins: slavery, and the genocide and displacement of the previous inhabitants. During the American Revolution [1765-83], slave-owner and future-first-president General George Washington sent an army on a scorched-earth campaign against the Seneca and Cayuga tribes, inspiring them to call him Conotocaurious (Burner of Towns), a title the Algonquians had already bestowed a century earlier upon his great-grandfather, John Washington. Just a decade after the American Civil War [1861-65], which had been precipitated in part by moves to expand slave states into the western territories, the US government engaged in another war, in 1876, this time against native populations who resisted the encroachment of gold prospectors and settlers onto their ancestral lands. In violation of the treaties they had signed, the US government supported the invaders, resulting in the Black Hills War of 1876, fought against the Lokota Sioux, Northern Cheyenne, and Arapaho tribes in the Montana, Dakota, and Wyoming territories. The US military won the war, with tragic consequences, including the creation of "Indian reservations". But the tribes did prevail in one high-profile encounter: the Battle of the Little Bighorn, popularly known as Custer's Last Stand. The "last stand" part involves a bit of mythologizing, since archeological evidence suggests that Custer, a hero of the Civil War, recklessly blundered into a number of tactical errors. Tribal accounts describe the fight as a quick affair, lasting "as long as it takes a hungry man to eat a meal". 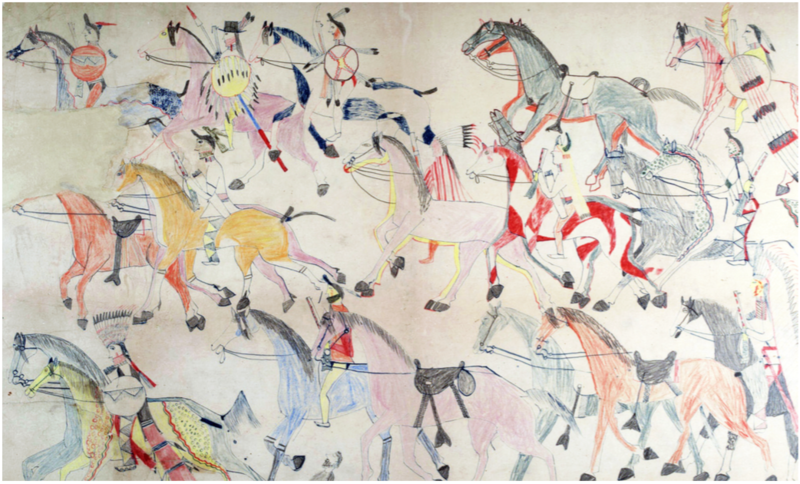 Red Horse, a Lokota chief, wrote a first-hand account of the battle, accompanied by his own illustrations, fine examples of a genre known as "ledger drawings". As one might guess, the term derives from ruled accounting and composition books, the best source of paper in the western territories at that time … much more convenient than traditional surfaces, like tree bark and animal hides. They also show the enthusiastic acceptance of newly available colored pencils and crayons. The all-over composition, sense of movement, and vibrant color imbue this drawing with surprising freshness, as though it could have been made just this morning. A special shout-out to the rhythmic punctuations of horses' hooves and black-tipped feathers. 16] Accompanying maps help us imagine Gulliver's Travels [Jonathan Swift, 1726], L'Île mystérieuse [Jules Verne, 1874], Flatland [Edwin Abbott, 1884], The Wind in the Willows [Kenneth Grahame, 1907], The Hobbit [JRR Tolkein, 1937], Dune [Frank Herbert, 1965], Earthsea [Ursula Le Guin, 1968], A Game of Thrones [George RR Martin, 1996], Perdido Street Station [China Miéville, 2000], to name a few. 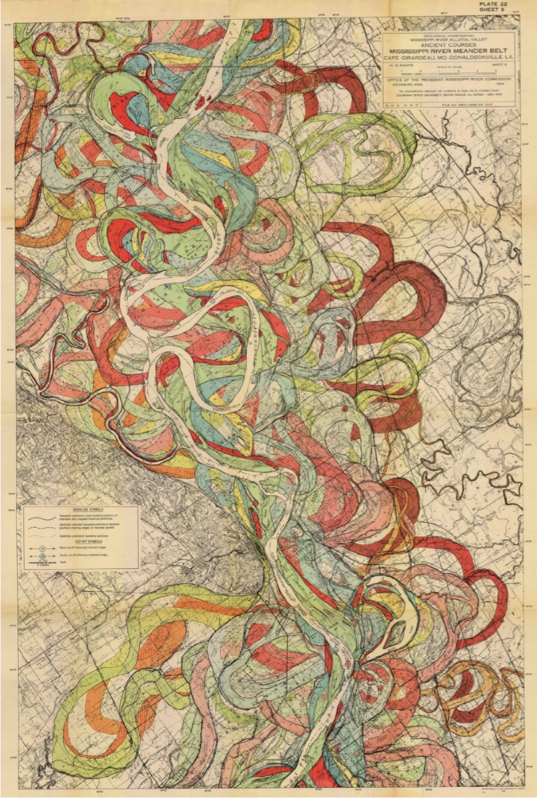 This map casts a line back deep into time (by human dimensions), following geological evidence to plot the meandering course the Mississippi River has drawn in the land over the past thousand years. 17] Sometimes political boundaries follow topographical features: sea coast, mountain range, river. At other times geometry rules. Thomas Jefferson's Land Ordinance of 1785, drew a grid across vast unknown territories, lands no one even knew yet the limits of, with a highly rational method of subdivision that could be taken through the scales — state, county, township — down to a single lot. The year before, Jefferson had drafted legislation to divide the land between the Ohio and Mississippi Rivers into six separate states. He included a clause establishing a north-south line, west of which no one could own slaves. The bill passed in Congress, but without that clause, which lost by a single vote. In 1493, Pope Alexander VI drew a line around the world, the Line of Demarcation, dividing the areas that could be claimed by the Spanish Empire from those that could be claimed by the Portuguese. A year later, it was adjusted a bit to the west, to account for Portuguese presence in Brazil. 18] The Pythagorean Theorem was the first bit of geometry my grandfather tried to teach me. At breakfast I would be presented with a problem — this time about triangles and the lengths of their various sides — and given until dinner to find the solution. That particular evening, he was pleased to hear the correct answer, but deeply disappointed to learn that I had derived it by drawing and measuring, rather than by applying mathematical principles (which he had neglected to impart). 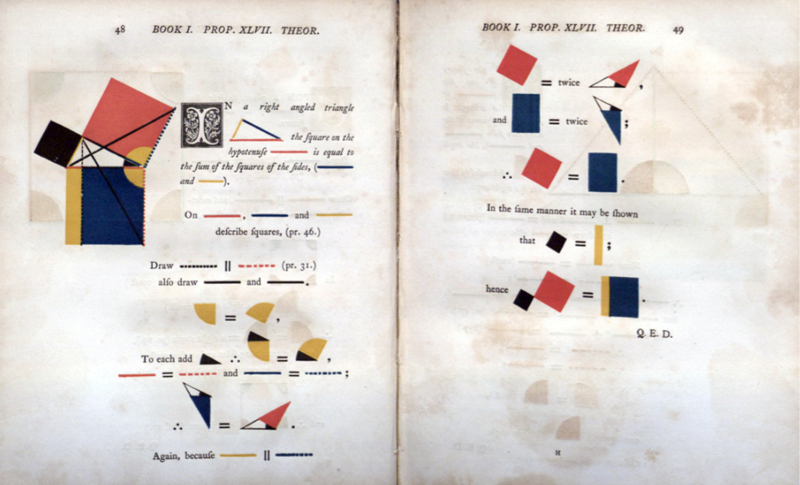 To my grandfather, Oliver Byrne's delightful color-coded version of Euclid's Elements of Geometry, published in 1847, would have probably represented a step in entirely the wrong direction. A large part of the book's charm lies in the strange juxtaposition between the diagrams, in bright primary colors that anticipate De Stijl, and the quaint typography. The large initial letters were printed with woodblocks carved by Mary Byfield. The book was on display in the Crystal Palace at the Great Exhibition of the Works of Industry of all Nations in London in 1851. 19] In Madeleine L'Engle's book A Wrinkle in Time , the "tesseract" was a secret government research project related to time travel, consistent with the cold war anxieties of the day. But the term was coined in 1888 by English mathematician Charles Hinton to refer to the four-dimensional analog of the cube. The fourth vector, which he termed kata-ana, did not necessarily refer to time; it was one of many vectors in n-dimensional space. Hinton was married to the daughter of George Boole, the inventor of Boolean logic, and, under an assumed name, to someone else, having children by both. Exposed for bigamy, he decamped for America, where he landed a position at Princeton University as an instructor of mathematics. In the few years he spent at Princeton, he invented a machine to pitch baseballs for batting practice. Hinton also wrote a number of "scientific romances" inspired by Flatland [Edwin Abbott, 1884]. The concept of "higher dimensions" was very appealing to a number of artists and intellectuals of the period who subscribed to esoteric philosophical movements such as the Theosophical Society, including architects like Claude Bragdon [Projective Ornament, 1915]. Along with Louis Sullivan and Frank Lloyd Wright, Bragdon argued for a "new form language" derived from geometric organicism. 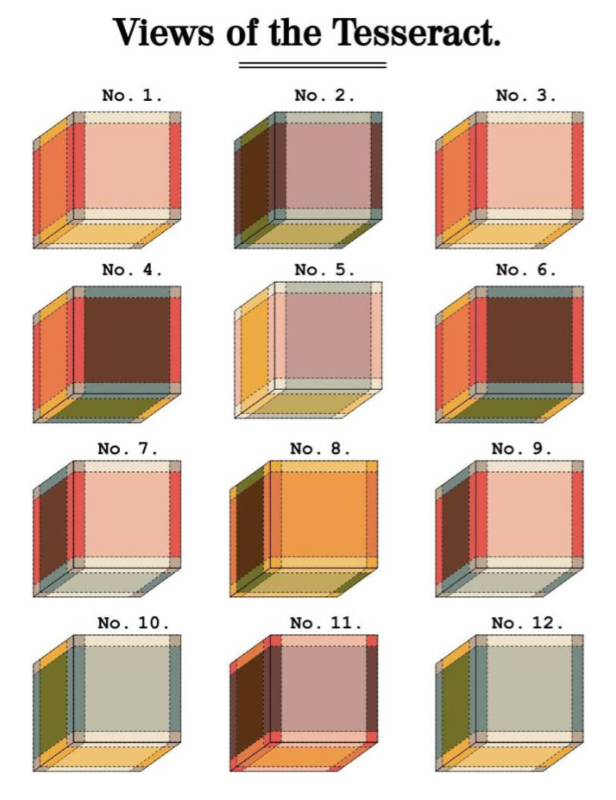 Unlike most attempts to represent the tesseract in its entirety, Hinton's drawings of colored cubes claim only to serve as visualization aides. Each view should be regarded, simultaneously, as part of an endlessly shifting series. 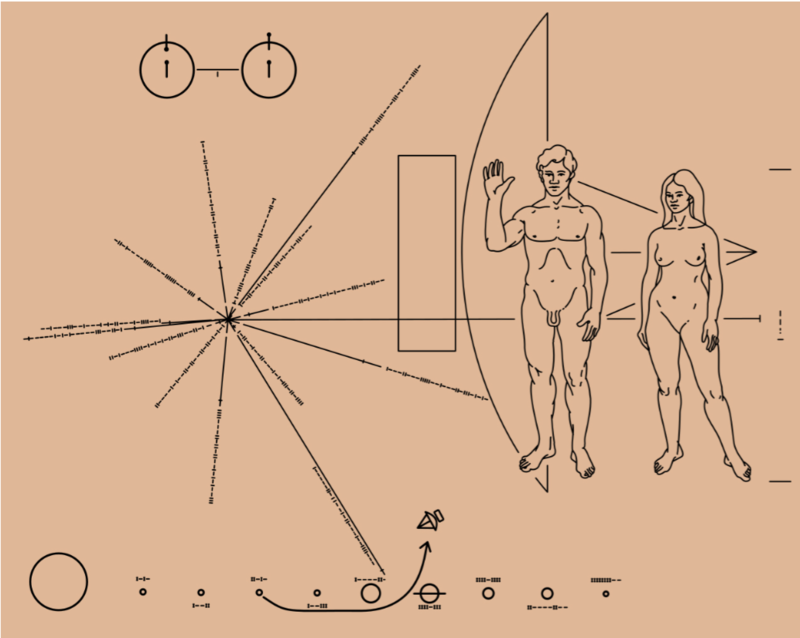 20] The Pioneer 10  and Pioneer 11  spacecraft were the first to move beyond the solar system, leaving some at NASA to think that perhaps they should display a message for any extraterrestrial life they might encounter. Accordingly, an illustrated plaque was affixed to each. And the two appear very white. Carl Sagan and his wife claimed they were going for "panracial" — hard to achieve when Leonardo da Vinci's Vitruvian man was the model. Many objected to their nakedness, especially the small line marking the woman's genitalia, which was removed. Beyond the dubious wisdom of giving our home address to a complete stranger, it is amusing to consider that they expected an alien intelligence to interpret western European drawing conventions. Leaving aside the question of scale — with atoms, humans, solar systems, and galaxies all jumbled together — how could it/they even know what a line is? Much less determine which one might be intended to signify a trajectory, which a fold or surface modulation, and which an edge? So many assumptions, leading to so many questions. One suspects, however, that we were always the real audience. Toward the end of Solaris [novel, Stanislaw Lem, 1961; film, Andrei Tarkovsky, 1972], one of the cosmonaut-scientists says, "We have no need of other worlds; we need mirrors."